Will OS X 10.7 "Lion" Be The King Of The Apple Jungle, The Last Of Its Kind, Or Both? As you’re well aware by now, this morning, Apple sent out invites to an event taking place in one week at their headquarters in Cupertino, CA. The invite reads, “Back to the Mac.” and asks those invited to “Come see what’s new for the Mac on October 20, including a sneak peek of the next major version of Mac OS X.” But the most interesting thing about the invite has to be the picture. It’s an Apple logo cut out a sheet of metal that has been slightly turned to reveal what’s behind the sheet: a lion. 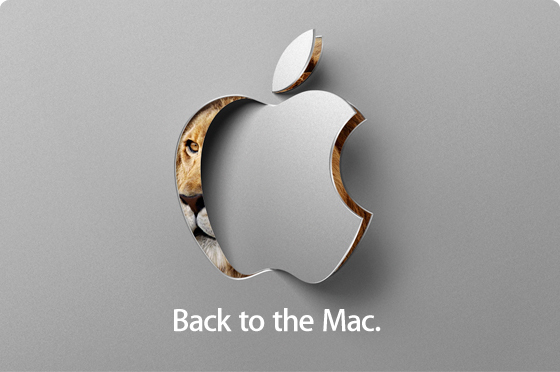 Apple began using big cat nicknames with initial release of OS X. 10.0 was “Cheetah”, 10.1 was “Puma”, 10.2 was “Jaguar”, 10.3 was “Panther”, 10.4 was “Tiger”, 10.5 was “Leopard”, and the current version, 10.6, is “Snow Leopard”. Initially, these were internal code names at Apple, but they eventually became a part of the marketing for the OS. And it certainly looks like OS X 10.7 is going to be dubbed “Lion”. On the surface, that nickname could easily be discounted as just a random big cat Apple hasn’t used yet. But this is Apple, they don’t do “random”. There are a few big cats left that Apple could have chosen from — Lynx, Cougar (har har), and even Clouded Leopard come to mind — but they’re going with Lion, the kind of the jungle. To me, this means they intend this version of OS X to be big. You might think that’s obvious, but consider OS X 10.6, which they named “Snow Leopard” — an extension of 10.5 “Leopard” — rather than giving it it’s own completely new big cat name. (Technically, snow leopards are from a different genus than leopards, but most people don’t realize that.) And in fact, Snow Leopard wasn’t all that different from Leopard other than it was faster and had a much smaller footprint. And Apple wasn’t afraid to say as much when they unveiled the OS in June 2009. As we noted back in June, the footprint of OS X 10.7 is already out there. We see it everyday in the TechCrunch logs, undoubtedly from Apple’s HQ where it’s being worked on. In the past few months, the number of visits by machines running OS X 10.7 has continued to increase.